I am asking this group because I know some of you are avid shooters, and there are a few that must be shooting competition. I shot small bore in grade school and a little in College (club). It was very relaxing for me and a good way to get control of my mind. Watching the proliferation of long range shooting and precision factory rifles has infected me with the bug to shoot 1,000 yards with proficiency. At 100 yards my rifle does not seem to care what ammo I send down the barrel; I hope to get some 400 yard shooting in soon so I can see how that changes. At 100 yards with Hornaday Match ammo shooting off the bench with my bipod and to the shoulder I am getting .75 MOA. Once I get beyond that, I suspect that I will be looking to reload and reduce the MOA to .5. I need to find a sled to test, but I suspect the ammo right now will give me the .5, but I am not steady as I used to be. When I get to reloading there seems to be as many variants in dies as there are in tires for planes. Again, my mission is to shoot 1,000 yards accurately. While I realize that I can go to my buddies house and borrow his dies and gear, my research shows that there are some dies that are much more prone to perfection in making concentric rounds and precise loads, even able to adjust sizing to fit the firearm. Like Bushwheels, I understand that I must pay to play; reloading is not a cost savings but an accuracy issue. From factory size, my neck currently expands .003-.0035 (depending on the case type), and the case expands as much as .0075 (6.5 creedmore). Ok guys, pardon the pun, but FIRE AWAY! How would you gear up to reload for accuracy? take the ammo you have that is factory and pretty good over all and over the counter. Shoot it out to 300 -400 yrds and see how it groups. Is it the ammo, the twist rate , or other factor that will decide if you need to change, IE does it not group well out there?. .75" at 100 = 3' at 400 7.5" at 1000 there is a lot you will need to get the 1000 yrd to 4"-5" Is it for competition or fun? There is a cost, time, and not to mention the fun to reload but there is always the question is it worth my time? Optics can play a big roll in your ability to shoot out that far too. Don't worry about the other expansion factors of the cases, how does it shoot at distance? From reading your post it sounds like you don’t currently handload, but would like to get into it to extend range capabilities of your shooting system? I could type pages, but I think to directly answer your question; don’t start out handloading with the intention of being able to create competition level hands right off the bat. There’s one helluva learning curve from rolling-your-own to actually achieving competition level handloads. Once you’ve handloaded a thousand rounds or so, it starts to fall into place. As far as where to start with gear? I’ll catch hell for this, but you can’t go wrong with an RCBS kit to get rolling, and then start upgrading components as you desire and need more/better. I use a rifle for work almost every single day, and many of the RCBS equipment that I got in my first kit, are still being used for the handloads that I depend on to make a living. Same press/scale I use when I make handloads for competition shooting. While RCBS doesn’t have the cache’ of the fancy names like some of the BR snobs are obsessed with, it will get you started and allow you to expand from there. The basic RCBS equipment, a good set of calipers, a Hornady OAL gauge and high quality components will break you under half MOA, if you do your part and your rifle system is capable (generally speaking, the human is limiting factor; far short of the system or the ammo). Redding Competition Dies are certainly better than RCBS, but I can make ammo on RCBS dies that shoots more accurately than I am capable of shooting through full custom rigs. Just to put that into perspective. Also, do some reading at www.6mmbr.com and www.precisionrifleblog.com and get a feel for what those competitors are doing. http://precisionrifleblog.com/catego...d-handloading/ is a good resource for competition level reloading info, and you dropped that Creedmoor name, so it’s applicable to what it sounds like you’re driving at. You can buy “competition quality” handloading gear so you can shoot in the .4’s at 300 for a few thousand bucks. Or start basic and shoot in the .9’s at 300 for a few hundred bucks, and build from there. There’s a lot of similarities here between the rich fellas with Carbon Cubs and the certified 135 cub guys. You can go fancy, but the “basic’’ stuff often can still beat it. For shooting at that distance you are going to have to do a lot experimenting to see what your rifle likes, shorter distances are far more forgiving. The key will be consistency, try to use components from the same lot and get your brass as uniform as possible. I used "Franken-dies" for my distance rig, a combination of Redding and Forster bodies and innards (I don't remember off-hand which was which). Loading for distance takes a little more attention and effort if you want best performance, but nothing about it is magic, just consistency. I've been out of it for a while so I'm not much help, I'm sure there will be lots of positive input here, this is a great community. You can't go wrong with the 6.5! If you haven't done a lot of handloading, start basic. A single stage press is about the most stable you can get, and cheaper than most other types. 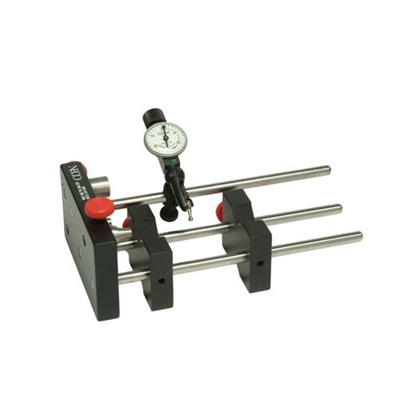 Get a separate decapping die to punch out primers without touching the case. That way you can do a proper cleaning and inspection of each piece of brass. Just for longevity and ease of use, I like carbide sizing dies. 'They' usually tell you that they can be used without case lube, but use the lube anyways (we all have stories about this!). And I prefer a balance beam scale for most applications over a digital scale. They're easy to check calibration and never need batteries. Once you get the hang of loading for your rifle/caliber, THEN look at buying fancier stuff. As to brands, whatever blows your skirt up. I started out with a Lee press and several dies and all these years later, after using several other brands, when I load for the best accuracy, I still get some of my best results with those Lee components. The down side to Lee is a limited selection of calibers. Last edited by tempdoug; 11-01-2018 at 12:18 PM. If you want to shoot accurately at 1000 yards, the only die you need is to neck size the cartridge, then trim the case to the precise length, measuring each and every case precisely with a micrometer or caliper. You can find the length with a lot of expensive measurement tools or experiment by finding the length where the bullet just touches the lands. You can use layout fluid, some people flame the bullet with a match etc. to see at what total length the bullet will touch the lands. You will not find accuracy at the distances you are considering by full resizing of the cases. You will not however be able to quickly feed and chamber such cartridges with ease. They will be tight when you close the bolt. You are starting on a fun journey with your rifle. Read as much as you can; www.6mmbr.com and books by Brian Litz gave me a head-start. I use the Redding competition dies as it makes it easy for me to make everything consistent. I neck size only after fire forming to the chamber and bump the shoulders back once they get sticky. I assume you have a scope that allows you to adjust to 1,000 yards. I use nightforce, but vortex makes a good scope in the PST for the money. A good light trigger that breaks cleanly is important. There are many brands, but I use Jewell. Make sure the bullet you choose matches the twist rate of the barrel. The guys at Berger Bullets or Sierra can help with advice on which bullets should shoot the best at your velocity. Knowing the horizontal distance exactly is important. Five yards at 1000 yards makes a vertical difference of about 4 inches in my 6.5-284. I use a sig range finder as it is the best one I have found for the money. A program to get you on paper, once you know your muzzle velocity, helps with different distances. I use the applied ballistics program on my iPhone. Cheap and worth the money as it has almost every bullet imaginable in the files. It makes the vertical easy with the challenge being reading the wind. I am not saying everything I mentioned is the best, it is just what I use. Shoot me an email if you have questions as a lot of guys helped me when I started doing the long range challenge. There is a basic, major factor needed, that all have overlooked. Your barrel. I’ll stay with the .223, as it is easy to talk about. We are going to 1000 yds. with this, altho I prefer my 6xc. Your barrel should be a 6.5 twist. A 7 twist might work, but a 6.5 is proven. That said, a Sierra 90 gr with a 26 or 28 inch barrel will stay right with our .30 cal Palma loads, actually better! With my 6xc, I went to a 7 twist, altho a 7.5 is adequate. With .30 cal, a 10, 11, or 12 twist, depending on your projectile, is adequate. Anything less than what I mentioned is a waste of time and money. Equipment—-Redding is the best over the counter die setup. RCBS will get you started. Single stage press. Remington or CCI primers, Hodgon powder(not temp sensitive), good cases, top grade bullets(Sierra, Berger, or Lapua), case runout gauge, Hodgon tool for bullet seating depth, and a lot of time! Have fun! Oh, and make sure your barrel is free floated! Get to shoot 1000 yds Sunday. And the weather is beautiful! I also like Redding dies. Hand dies are another option that can be custom made with the same chamber reamer if you decide to go with a custom barrel. The 6.5's are good. Many of the 1000 yard competition shooters today are using a small 6mm cartridge like the Dasher and 105 VLD type bullets. But if you also want to use the rifle for hunting a little cartridge like that isn't going to work well. It is important to keep the velocity over the speed of sound at your target range. Some cartridges struggle to do that, like a .308 Winchester. speed of sound is 1125 feet per second. dan, curious to what speed of sound to effect on bullet has? velocity is good but is there some type of factor when it gets below the 1125 fps. Accuracy goes away when the bullet passes through the sound barrier. That's why target .22 LR ammo is kept low velocity - subsonic. Still loving the 6.5 barrel you made for me. It still stacks them one on top of the other. I will be getting with you soon to get a barrel for another project. Bring it down. I’ve got more of that stuff than Brownells does. I’ll be home mid - November. I should have mentioned that I had hand loaded as a kid. Our evenings used to be all of us sitting around the front room with the press on the coffee table loading shotguns; up early to go shoot it all, then back at it the next night. We did some rifle also- so it is not foreign to me. I have a Tikka T3X A1 Tac with the Vortex Viper PST (series II), which I know will out shoot me right now. I have some adjustments to make, and will be testing bullet weights as I go along. Seems it likes heavy bullets. I just don't want to go down the road of marginal reloads making all the effort not worth squat. Thank you for all the information so far, I am looking seriously at the RCBS kit to start, with a couple additions. The dies seem to be a key component. Last edited by tempdoug; 11-01-2018 at 04:34 PM. I shoot a lot of Long Range Matches with Buffalo Rifles. We are constantly playing in the transonic range. One of the hard things for people to grasp, is that a faster bullet does not correlate with less wind deflection. Just the opposite. Last edited by S2D; 11-01-2018 at 05:15 PM. That just sounds like lots of fun!! Yup, I will need a full education on windage! Reloading is fun and a great way to spend an evening with good friends and some bottles of suds. I have some old M-1 Carbines lying around and enjoy loading for them. Good time. I always laugh about being able to shoot 500 yards, let alone 1000 with decent accuracy. The life of an aging astigmatic is tough for long range shooting. I used a 404 Jeffrey recently on a 5 inch gong at 250 yards and was delighted that I hit it! I have one but haven't spent any time working up an accurate load for it. Mostly a 45-90. Daughter shoots a 40-65. Complete opposite end of the spectrum from what you are about to embark on. Iron sights, no resizing at all, paper patched bullets etc. I'd be lost in the HP long range world. You need to figure out what your gun likes for bullets and powders. It takes a while, want to find a sweet spot (putting the bullet to sleep) then go from there. I am going to try a 6.5 creedmoor in the Savage GRS10 next. I like Redding dies. If I may borrow/hijack this thread. I just happen to be looking at buying creedmore 6.5. I don’t reload anymore, so I am looking for a factory gun and factory amo that can reach out to 1000 yards with reasonable consistency. Coyote type shooter. Can it be had? i have a 55 gallon barrel at 1000 yds, with a regular scope, i wouldnt waste to much time dwelling on a 1000. let alone trying to hit a coyote. so im going to say it can be had but cant be done. go set a milk jug at a 1000 and see what you think, thats all a coyote is. every rifle will do it, human part is to limiting at that range. Here's another debate for you reloaders. 6.5 creed vs .260 rem. I know the pros for 6.5 creed is factory load availability, but is there any advantage for the reloading of the 30tc case over the .308 or is it just that hornady made use of the 30tc case after flopping and just has the marketing funds to keep it a float? The 280 i have is the flattest round ive ever shot with factory ammo. A friend reloads for me now and with 160gr bullet i have it sighted in at 2.75" high at 100yr with nickel size group. No drop at 200yr and a quarter size group. 3 round groups. Im no expert shooter and shoot off a pair of coveralls (no sandbags). Once again the 280 being another of remingtons marketing flops but a sweet round. May be interested someday in making it a 280ai but it shoots so well now and i dont reload, so why bother? another little thing for 1000 yard shooting is to study scope and scope mounts before calibers. For the record. My favorite hunter is a 700 bdl 243, and I have found some factory loads that it likes out to 550 yrds, but one can never have too many toys. Much beyond 550 yrds for me would be mostly for range play. I’ve been looking at 25-06, 270 and 6.5. I used to load 308, but never liked the kick. More research and some longer range shooting today. First, to reply to MoJo- After reading up on how to actually measure groups, (center to center is proper, I was measuring outside to outside), I found that I am shooting .5 MOA with a new rifle, and factory ammo. The Federal Fusion available here, (not a high dollar load) was about .75 MOA; Hornaday Match was down to .5 for most groups, but was a tad under that with the 147 grain. Tikka T3 X1 A1 TAC, Vortex Viper PST 6-25x50 Scope. As I said, read up on proper measurement of groups, and found that with Hornady Match I had one group less than .5 MOA. Today I was shooting 250 yards with some gusty winds up to about 8, and still had one group of less than one inch, which computes to less than .35 MOA, the other about .4 MOA. Wonder if I can reload that good? I have a bunch of RCBS stuff I don't use anymore. The factory stuff is really good these days. We are living in the golden age of riflery and reloading. Some of the new bullets and powders are nothing short of amazing. Anybody have any input on a Christensen MPR vs the Tikka? Darn it.. I forgot that the gun was just the down payment. That is some good shooting! Can you do better with reloading? Probably, but it is going to take some time and experimentation with load combinations etc. My best improvement came from fireforming the case to the chamber and then neck sizing only. Your mileage may vary. My cousin just went down the same path with the 6.5 Creedmore, but he wanted to reload regardless. This is the list I put together for him. Good press with great leverage and an easy throw. Redding Bushings for above once you measure the fired case and figure out how much tension you want on the bullet. It also comes with a body die to set the shoulders back once the case gets sticky in the chamber. Sounds complicated, but not so much. This is great as you punch in the charge you want and it automatically trickles the same powder charge every time. This is the most time consuming part for precision. It takes time to trickle to the exact grain. This makes the worst part of reloading, to me, a snap. You can use powder measures, but, they just are not accurate enough, in my opinion, for precision rifle. This has the primer pocket uniformer, flash hole deburring tool, and neck chamfer tools electrically powered. Saves your fingers. Good set of stainless calipers. $?? I like the Mitutoyo's, but there are good cheap ones also. I used to use the spray on lube and had many stuck cases. This all but solved the issue for rifle cartridges. A little tin lasts for thousands of rounds. This all totals to $1214. You can get reloading kits much cheaper, but will end up with something like this if you want precision, so you might as well buy it the first time. Good thing is that you can use everything but the dies for other calibers you want to reload. Then you will just need a progressive loader for pistol calibers and a shotgun shell reloader. And a digital chronometer to get your muzzle velocity for your drop charts. It never ends, kind of like airplanes. You guys realize that the man that held the record for the smallest group at 1000 yds for about 20 years, used a Lee Loader kit to build his ammo. Probably costs about $40 today, for one of those kits. It's craftsmanship not tools. Even if you go full time into the 1K game, you build up to the kit that you need. Start out with a solid frame press and good dies. Above that level, you only buy what you actually need. Come to think of it, it's kind of like bolting on all those mods on your aircraft, 'cause your buddy has them or you 'might' need them instead of keeping the aircraft light. Reloading is actually fun. Minimal effort will have you shooting better groups than factory ammo. Speed and accuracy = $, do you have to have sub moa for a moose? Or are you shooting 13 striped ground squirrels at 500 yds? Or just punching holes in paper to see how small the groups are. I put 3 shots in about an 8” group a long time ago, at a mile. Tight neck 338/378 wby, custom BAT action built by Bruce Baer. 300 gr Sierra match kings. Cost a lot of money for that rig. Nightforce scope, tapered bases. Etc etc. Sold it to a friend and it was stolen out of his truck, never to be seen again. At the time, I built it for long range elk. Shot plenty of em. Don’t hunt much anymore except pigs and coyotes out of a flying machine. So Tangle, build your gun for what you are going to use it for. Shoot good factory ammo and you will probably be surprised how well it does. Now that is a rig. Thats just a little smaller version of a 16inch gun on a battleship. Not much though. sittin here just thinking about shooting that. muzzle brake? not much less than a 50. Buddy of mine comes out to shoot prairie dogs this year. Some of the ammo he sends out is 200 rounds of 300 magnum which I think there is no way we are going to shoot all that. Plus it is a little overkill for a little doggy. Well my buddy gets off the plane and I pick up the rifle case which weighs a ton. I say what the hell is this which turns out to be an Accuracy International 300 with muzzle break and supressor and the Hubble telescope attached. WTF So we head out to a place I know that measures 940 yards. Took me four shots to wack a small dog. Factory ammo no less. I was stunned. We shot all 200 rounds in one sitting. That gun kicked like my AR. Hearing protection was not necessary. I could not believe what kind of performance that gun had. I reload and had to laugh when he shows up with about a 13000 dollar gun that he used factory ammo in. Well the joke was on me. All those hours spent tweaking guns and ammo and now I realize all I had to do was spend the money and I could have spent more time drinking beer. Then again I would not have had any money left for beer. Got me a contract protecting the Red River from northern are-do-wells trying to steal fish and game from the great (half) state of Texas!!!! Well, actually, trying to kill paper at a high level of accuracy. Shooting .34 MOA with factory loads at 250 yards makes me wonder if reloading will do much better; I am sure a bench rest would close even that group down. Reloading will only save me about $.50 a shot comparing to Match ammo. Wish you still had that rifle, I would love to try a mile long shot!!!! Thanks for all your info. I might go out for coyote today, sunny with soft 1" snow... good tracking day. Anybody reloading .45-70 and/or .30-30?